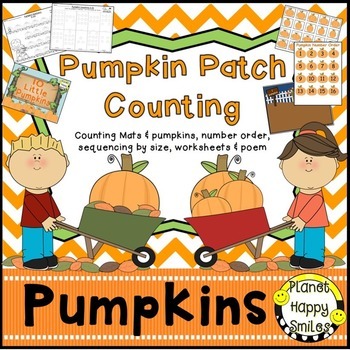 This file has Pumpkin Counting activities for your students. It concentrates on counting and recognizing numbers 1-20. 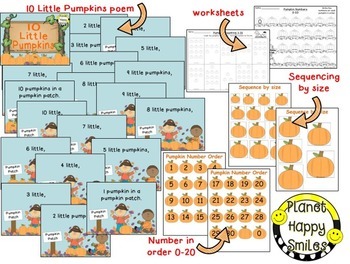 There is a cute poem, "10 LIttle Pumpkins", that you can use during Shared Reading to emphasize number order and counting. You can also print it, laminate and bind together to make a book. 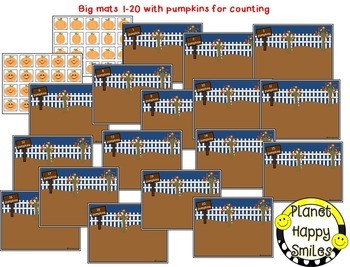 There are 2 sizes of pumpkin counting mats: Full page size and half page size. You can also use these mats with play dough. The children will have a blast using their fine motor skills to make the balls for the pumpkins and putting them on the mats. Print, cut out and laminate the pieces. 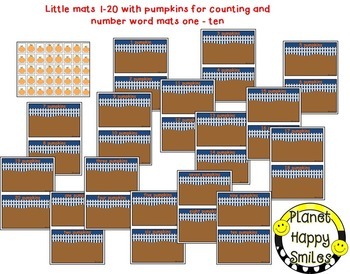 It can be used as a whole group activity to recognize and count to 20. After instructing with the students, put it into a Math center or station for them to manipulate on their own. There are pumpkins with numbers on them 0-30 to put in order. There are pumpkins of different sizes to put in order and there are 2 worksheets for counting and writing numbers in order. Happy Counting! If you have any suggestions or comments, you may write us at planethappysmiles@gmail.com. If you like this product please rate it on the TeachersPayTeachers page. Thank you for your purchase. Please follow us to get updates on our newest products! Thanks so much!